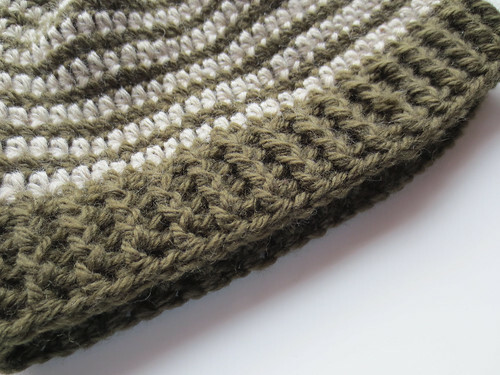 Repeat ribbing round without turning for 4 rounds for adult hat and 3 rounds for child’s hat. Such a nice design. Great job. I love these little caps – looks like they would keep my ears warm. I am at round 5 is it supposed to be wavy or lay flat at this point? @Kenni – It is a bit wavy at this point but by round 8 or 9 it all flattens out. Let me know how it works out for you but if you keep going you will find it all works out well. Best wishes. By the picture, it looks like last round is sc or sl st? Or is it rib? Betsy — It is still the rib stitch, just repeat the ribbing round. Just looks like SC in photo. 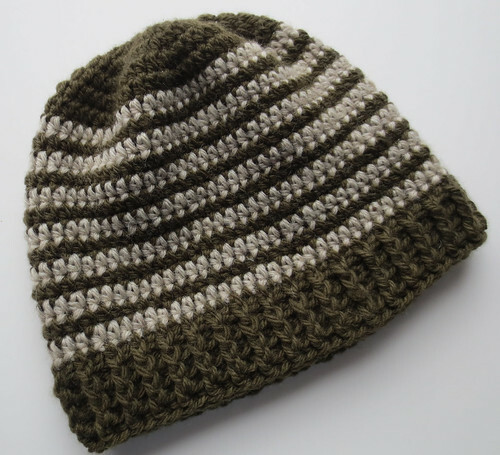 the striped hat picture looks like the rounds alternate in different widths but the pattern says hdc for every row. how did you get the thinner/thicker striped look? Brenda – Each round is Hdc and it is just how it looks with the different colors. The yarn was all the same wool weight. It is just kinda cool how it works out and has this look. Let me if I can help further. amazing pattern, I love the fpdc and bpdc for the rim. I used this pattern and added ears, eyes, nose and whiskers. I will use this pattern for a long time. thank you for sharing it. Is the written pattern or the finished product not used for resale? I am to understand that it is the written pattern, however I do have a few people who are interested in the finished product. I look forward to hearing from you. Again, I really enjoyed making this beanie. Thank you! Yes it is fine to sell the hats made from the pattern. I would ask that people provide a link back to the original pattern to show ownership of the written pattern. It’s my first time making this pattern, so far it is great and easy to follow! I am making the hat for my husband who has a really big head…. I just finished round 5, but I’m wondering if I should make one more round of increasing the stitch, or if that would ruin the overall shape. If I can add one more round of increasing, what count should I do? Esther – You can make another round and it will just fit looser or maybe just right if he has a big head. It all depends on the yarn as it may be okay either way. It won’t really hurt the shape. Let me know how it turns out. I have made this hat 100 times . I love it and make it for a nursing home. Thank you so much. @Cheryl – So glad you shared this. I just love hearing from people who are using my patterns. It is so nice that you make things for nursing homes too. I wish there was a gauge for this pattern. After finishing round 5 it just doesn’t seem like it will be a 22 inch circumference. After trial 1 of this pattern, and seeing how curled up it was, I ripped it out and started out with double crochets for the first two rows and then went back to half double crochets for the remainder of the hat. It lays nicely now. After round 5, I did a straight round and then added another increase round to ease in the straight part of the hat and to increase the circumference. @ Melissa – Hope the pattern turned out okay with your mods. I know with some thinner yarns, I do add a few stitches before working even on round 6. The hat generally does fit okay and I’m not very good about gauges. 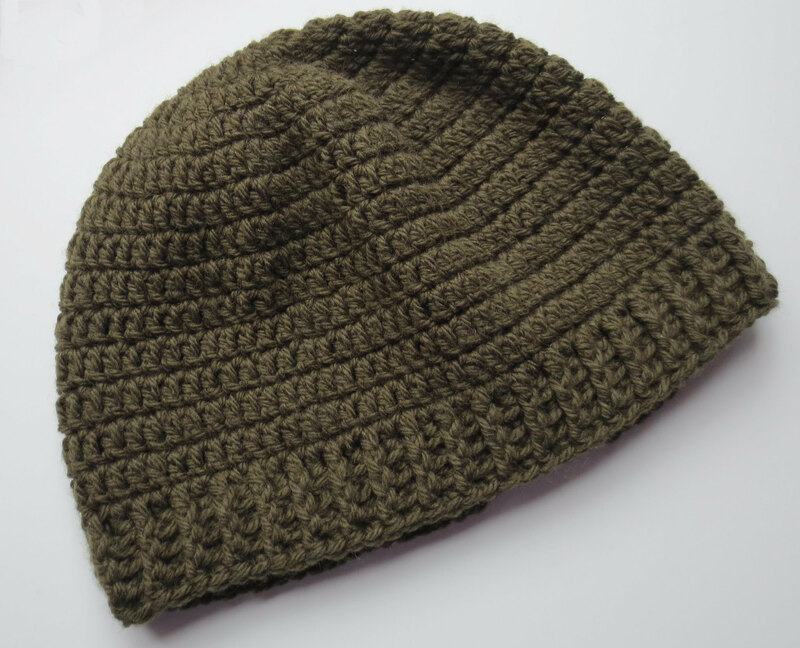 The hat pattern does curl up and that is how I designed it to flatten out after round 5. Thanks for the feedback and hope you do enjoy your hat. Cindy, thanks for sharing this. The hat looks gorgeous. What is the sm stitch?? Sm stitch is an abbreviation for same stitch. Meaning you work into the same stitch.